“Performance Art” began in the 1960’s in the United States. It was then that the term “Performance Art” was really sedemented and thus began the beginnings of this form of art. Prior to the 1960’s performance art, other groups of musicans, poets and writers had already performing their works. Groups includes the German Bahaus who questioned space, time and light in theatre performances, the Dadaits who merged visuals arts with spoken word and the Beatniks who utilized poetry in their performances. Performance Art was almost a social commentray on art, works were not bought or sold, they were not in galleries. The work could be taken directly to the public eliminating the middle man of the art world. Because Performance works could never be done twice, the work required documentation. Originally I intened to focus my research on the body modifications in art and how technology has changed this aspect of art. This topic was broad, after reading more about performance artists and the consistent documentation that was necessary in their work, moreover how the documenation become vital and apart of their work I decided to end my research by looking specifically at the works of six prolific works of performance art all dating in the late 1960’s to early 1970’s. 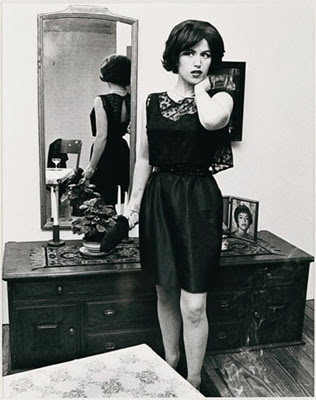 The artisits I will be looking at are Vito Acconci, Chris Burden, Michel Journiac, Gina Pane and Marina Abromovic. Each of these artisits left behind various forms of documenation for pieces that happened only once. The video, the photograph, the audio or the written words are scraps left behind to performance art. However Marina Abromovic in her Seven Easy Pieces recreates some of these works, what is documenation to the works? Is it necessary? Considering the actual affect once has of being documented, how does it affect the work? During this time period, the beginning of Performance Art, black and white photos and fuzzy videos remain, adding all the more thetrical decption of the performance. Could this be intentional, the documentaton leaving a speration betweent the viewer, making the work all the more mythical, but there is a need for existence and for recognition. How will technology and media affect this and thus how will it affect performance art. Was the success of the works due to the lack of documentation? For seven consectuvie nights Marina Abromovic performed five performances done by precedor artists who she explained having an impact on her as an artisit as well as two original works. The performances were done at the Guggenheim Museum in New York City. She has explained that she felt “obliged” to perform these works to keep them in history and allow these performances the credit they deserve. Seven Easy pieces is a reminder of the documentation of performance art, the importance of it and the need for its existence. 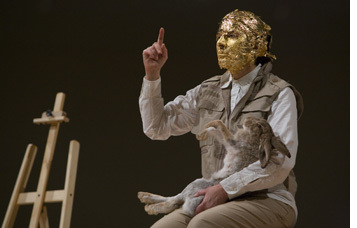 Gina Pane The Conditioning (1973) Joseph Beuys’s How to Explain Pictures to a Dead Hare (1965)Marina Abramovic, Lips of Thomas (1975)Marina Abramović, Entering the Other Side (2005). Gina Pane created metal sculptures by bending sheets of metal into shapes using these structures and her minimal use of color, Pane developed an interest in body art. She soon incorporated her work into sculpture and installation. However her fame as an artist stems from her performance pieces. In many of her works she made incisions on the skin of her hands, arms, back, belly, lips, tongue, and eyelids. She even used her own blood and wounds as a text, writing a an art manifesto “Letter to a Stranger”, from the work “If I open my body so that you might see my blood, it is because I love you.” Works during the late 60’s and early 70’s by pane include “the Conditioning” and “Unanaestheticized Climb” in which Pane climbed up a ladder she constructed with metal pieces protruding out of the steps. Injury and infliction was meant to bring a raw experiences through unpleasantness. Boston 1972, Chris Burden a young performance artist asked his friend to shoot him in the arm. Originally the bullet was meant to gaze Burden’s arm but the bullet went through his arm. “In this instant I was a sculpture ” Burden went on to say. The instant was when the bullet from a 22 long rifle shot from 13 feet. The performance circulated around the current fantasies and interests in western and gangster movies. More importantly, Shoot took place during the escalation of the Vietnam War. America at the time was more than familiar with images of soldiers overseas, ware-fare and news castings of body bags. This piece presented the current fears and common dispositions of guns and bullets by showing an audience what actually happens when a bullet is shot vs. a film. Also, the work questions the concept of power and taking orders. Burden’s work was re-sensitizing people to the violence that had become less and less shocking due to its prevalence in the news. He challenged the art world’s traditional preference for the fine arts. Burden, at the time an unknown artist seemed to also be challenging himself, and his determination in art. Burden has even said that one of the reasons he performed Shoot was so that he would be taken seriously as an artist. 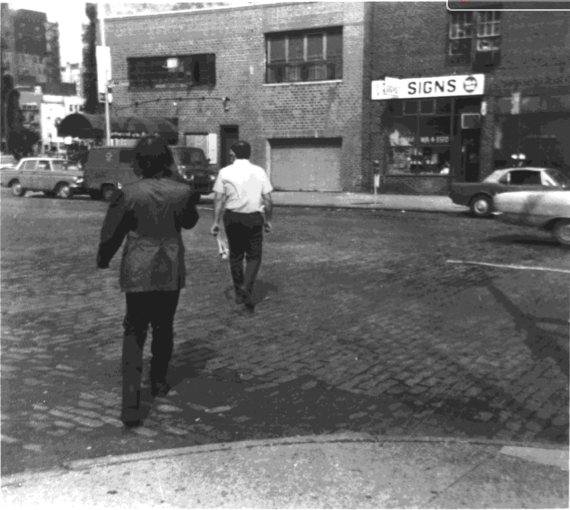 Like Michel Journiac, Vito Acconci documented his work extensively. 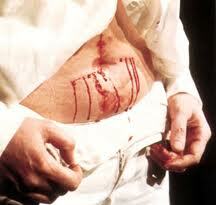 His many performance pieces, which greatly relied on the use of his body, would of course require documentation. However it seems that the documentation his works with most often photographs, but also video, contact sheets, logged descriptions and written reflections were necessary for a proof of witness and existence. 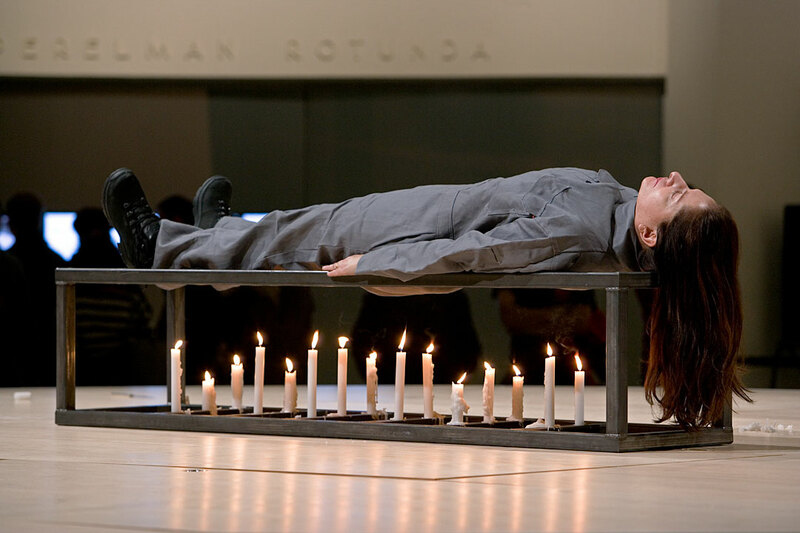 In Acconci’s Seedbed, for three weeks, eight hours a day Acconci performed at New York’s Sonnabend Gallery. Visitors entered to find the gallery empty except for a low wooden ramp. Below the ramp Acconci masturbated, basing his sexual fantasies on the movement of visitors above him. He narrated these fantasies aloud, his voice projected through speakers into the gallery. Following Piece, performed in New York City between October 3 and 25, 1969.